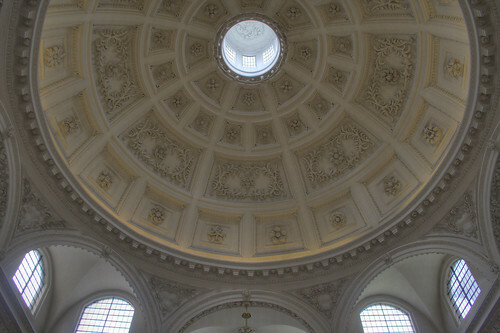 Sitting in a corner behind Mansion House at Bank sits a 340 year old church designed by Sir Christopher Wren, with a huge dome modelled on that within St Paul’s Cathedral. 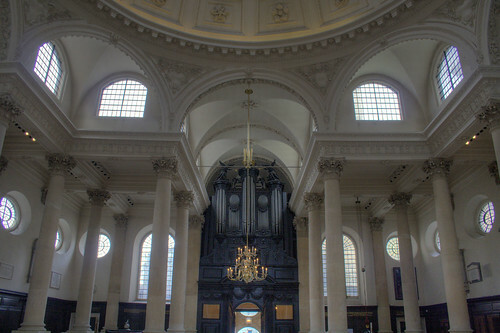 It doesn’t look like much from the outside, with just a tiny door for an entrance but the interior of St Stephen’s Walbrook is quite impressive, with pre-Victorian clean lines and a more modern layout. There has been a church of this name in the area since at least 1090, sited here as there used to be a river, the Walbook running down to the Thames. The church hoped over to the other side of the small river in 1429, but that building was destroyed in the Great Fire of London. Along came Wren and the replacement church was built between 1672-9, so the current building is this year celebrating the 340th anniversary of the start of its reconstruction. Entering via the tiny doorway, the interior looks almost modernist, but that is deceptive and mainly due to the layout of the wooden pews in a circle around a large stone altar in the centre. 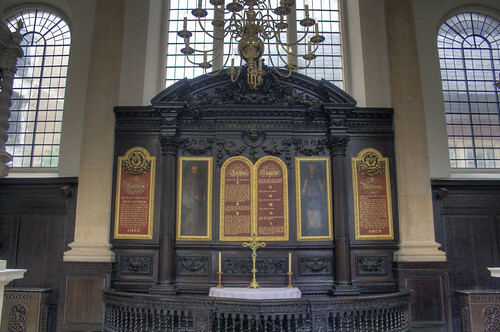 Originally it had conventional rows all facing a conventional altarpiece. The stone altar is unusual, and was supplied by Henry Moore. It was controversial, not only in design, but also in placement in the middle of the church. So controversial that it had to be approved by Judges at the Court of Ecclesiastical Cases Reserved after an appeal against it. Sitting here in the centre of the church, with pews around it though means that anyone looking heavenward will look up to the awesome space of the great dome above them. The original pulpit is still here, although it now sits behind a quarter of the congregation. 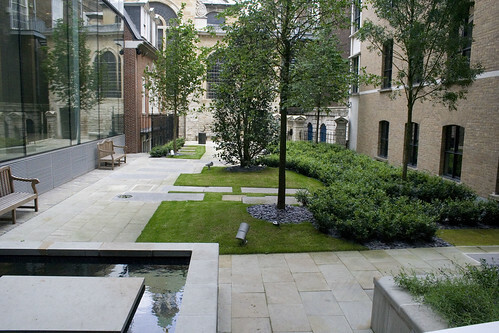 On my visit, the back door to the former graveyard — since turned into modern garden — was also open, although the graveyard is also accessible by a side gate from behind Mansion House. If you want a coffee with your contemplation, then rather uncomfortably, a Starbucks has been squashed into a corner next to the church entrance. The church is normally open on weekdays from 10am until 4pm. It is usually closed at weekends except for great festivals. I have been in this church and several others in the area a couple of times when I have had a walk around London, what amazes me is how they manage to exist, don’t get me wrong London would be the worse for the loss of such gems but how do they find the money for the upkeep of these glorious places. Thank God they do. (no pun intended).